This time we have a VW Transporter T5 that was built by Andi Riley from Wakefield, England owner of “Not just Campers”. Andi calls the van a Transporter RST5 because it’s powered by an Audi RS4 powertrain! In 2015 the project started with a standard vw engine without any room and just 140hp to work with, and in 2016 it was already swapped with a RS4 4.2ltr Audi engine and it had instantly 458HP (stock). That was quite a big difference! 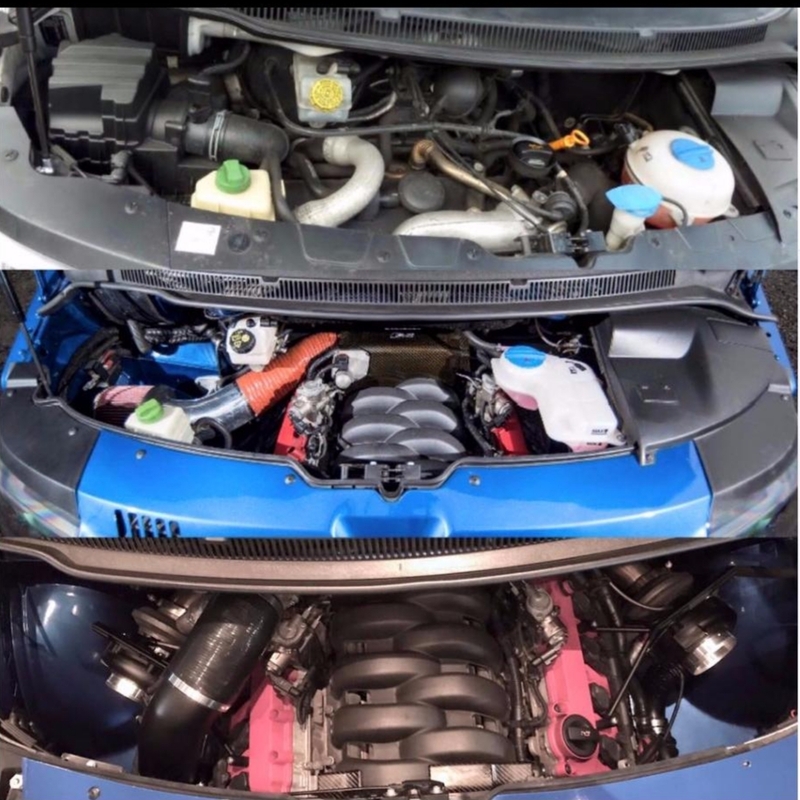 Later in 2017 the engine got out of the engine bay and got completely modified and it became a RS4 4.2ltr Audi engine with two GT35 turbos producing 745HP! That’s almost 300HP more than before and 600HP more than stock! But it all changed fast! Under the hood it had in our last post a 4.2L V8 FSI engine from a 2007 Audi RS4 that produced 435HP and 351 lb-ft of torque, which was already interesting for a bus! But Andy didn’t stop there! There was more room under the bonnet! Twin Turbo RS4 V8 4.2 FSI?! At the moment this Transporter has a twin turbo setup, with 2x GT35 Garrett Turbochargers on a stock engine and it produces 745HP and 812NM of torque! What a beast it has become! THAT’S impressive and SICK! Applying that power to the ground is the job of the full Audi RS4 Quattro drivetrain which has been used during the swap with ofcourse custom driveshafts and axles. Damn! Not only the engine was important for Andi. When you got that much horsepower you also need better brakes! To stop this heavy van, Andi has put some Audi RS6 discs and brake calipers which weren’t unncessary! The van’s best quarter-mile is in the 12 sec. In a van?! Some of the videos below are from the period without the turbo setup and the last videos are with the turbos and you can see the difference! This van goes like a rocket! Watch and leave a comment! 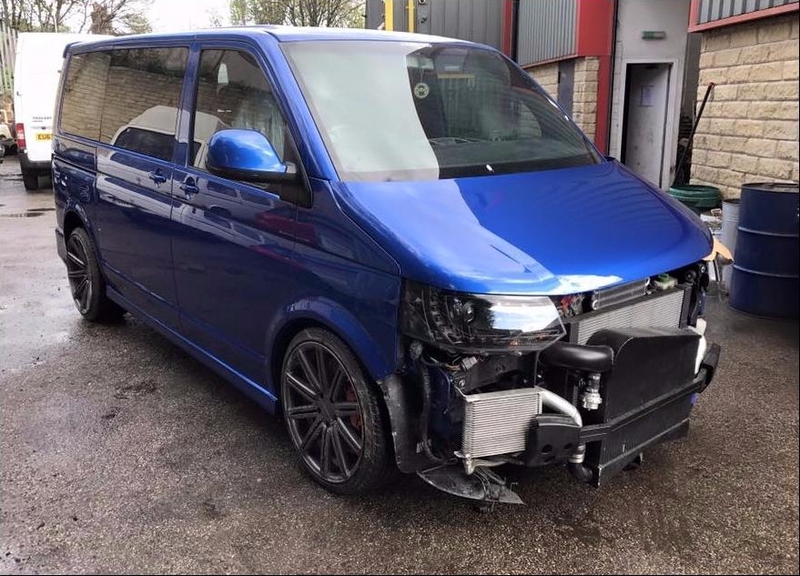 Watch the videos below, to see how this big and heavy Volkswagen Transporter accelerates like a supercar and leave a comment below or share this one with your friends. It even has beaten a Lancer Evo on the drag strip! Check out our website further for more posts or follow us also on Facebook and Instagram @TurboandStance, to check out our daily updates! Thanks for the support guys!